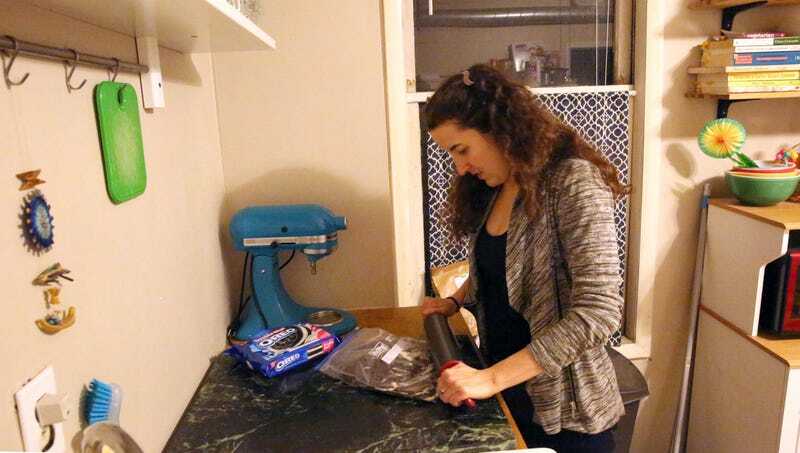 MANISTIQUE, MI—Saying it was hard to imagine her Christmastime treats without the ingredient, area woman Geena Wolferman confirmed Monday that 92 percent of her holiday recipes involved pulverizing a bag of Oreos. “My go-to dessert is this chocolate pudding pie with an Oreo crust that absolutely everyone loves,” said Wolferman, describing just one of the ways in which an entire 14-ounce bag of the sandwich cookies is smashed into tiny chips and then incorporated into 9 out of 10 of the dishes she prepares for the holidays. “Another favorite of mine is taking two bags of crushed Oreos, rolling them into little balls, and then dipping them into melted chocolate. Sometimes I also throw a handful of those on top of this special cookies-and-cream ice cream cake I make by folding Oreo crumbles into vanilla ice cream and layering it with rows of Oreo pieces.” At press time, Wolferman was pounding furiously on a bag of Oreos to place in a bowl just in case someone wanted to add some extra crumbs.